Does what it says. Really good for keeping the little ones drawings all together. Can store about 3 reams of printer paper, to give a better idea of capacity. Brilliant, bought to store daughters home schooling books in. Great value. 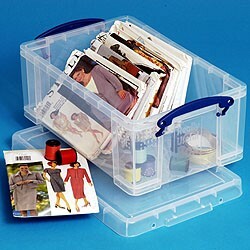 I love these boxes - so useful for all my textiles. They close well, stack well and transparency is really useful. Perfect size to hold my grandson's train set. Sturdy enough to withstand him sitting on it (age 2 years). See through ensures we can identify contents. Lid is a really good fit. 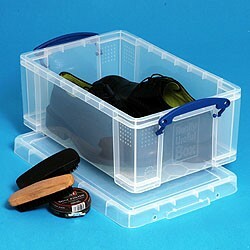 I have bought several of these boxes for similar uses. Very happy with this product. 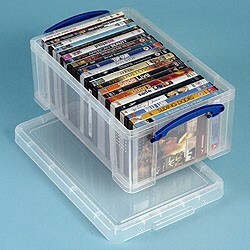 These strong, transparent, stackable boxes are perfect for storing papers, maps, letters, etc. This size, 9 litre, fit the usual shelf width and height. The click handles secure the top. 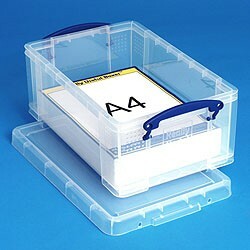 They are easy to dust, wipe and are excellent archive boxes. Great product.